Armistice Day 2018 was marked in Bantry with a special ecumenical service at St. Brendan’s Church. The high point of the ceremony was the unveiling of a new First World War memorial plaque following the traditional two minutes of silence at 11am. Until now there has been no one memorial in the area listing all those, from the parish, who died in the First World War. The new memorial rectifies this. The Rector, Canon Paul Willoughby, spent four years researching the history and background of all those from his parish area who died in that conflict. In that research he discovered that 90 young men from Beara, Bantry, Durrus and Kilcrohane had died and that a further 31 were buried in the local cemeteries. 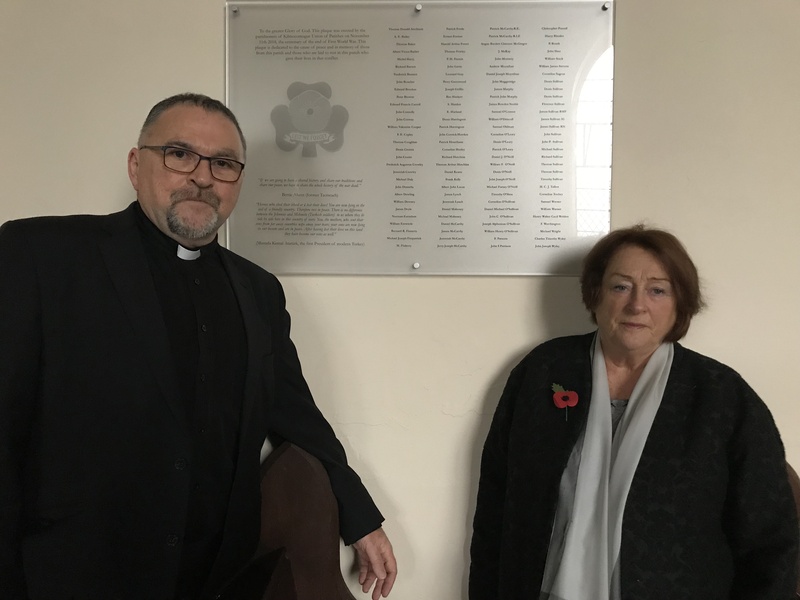 The new memorial, which lists each name, was dedicated to peace and to the memory of the 121 from this parish of all denominations, faiths, traditions and religious backgrounds who died in the dreadful conflict and also those from other places who are buried in cemeteries in the parish. My great uncle Charles died on the 17th June 1916 at Ypres. He is buried in a grave at Essex Farm Cemetery, close to where he fell. He is remembered by our family, and formally in his own parish church at Tinahely in Wicklow and also, more recently, at the Wicklow War Memorial at Woodenbridge. My wife’s great uncle Harry Green is also buried at Ypres, in New Ireland Cemetery. We visited Ypres in April 2018 and had the opportunity to visit those immaculately kept cemeteries and to attend the ceremony at the Menin Gate. It is so important that people have an opportunity to remember, a place to go, be it a grave or even a name inscribed on a solemn memorial. The names on our new plaque are all local names, from local families. It is so sad to think that 107 young men from the parish went to war and died, four pairs of brothers among them and one aged fifteen. The names of some of the places where they died still send shudders through us – Gallipoli, the Somme, Ypres and Jutland. It is unimaginable to think that 31 of them are buried here in graveyards and cemeteries from Maulinward in Durrus to The Abbey in Bantry, from Kilmocomogue Burial Ground, Kealkil to Rossmackown Cemetery and to St. Finian’s in Castletownbere and Bere Island. (where 26 are buried). Among those who attended the ceremony at St. Brendan’s Church were families whose names were inscribed on the new plaque. Frances Jennings of Rooska remembered her uncle Tommy (Baker) who died on the Western front in July 1917 and is buried in Belgium. Ecumenical guests of honour were Angela Muckley whose uncle Richard Barrett died aged 20 at the Western Front in September 1916. He has no grave, but like so many of his fallen comrades he is remembered on the Thiepval Memorial at the Somme. Another guest of honour was Tommy Mullins, whose uncle Michael O’Neill survived the war and died very shortly after arriving home to Ballycomane, Durrus. Later that day a small group travelled onwards to Maulinward Cemetery for prayers at the grave of Michael O’Neill, where in October the Bishop, Dr Paul Colton, had also travelled to lay a wreath. The grave of Michael Fursey O’Neill, near Durrus, County Cork, on Armistice Day 2018. The plaque was unveiled by Angel Muckley, Tommy Mullins, Robert Fennell of Goleen who has provided invaluable assistance to the project, Sandra Dukelow, whose father in law survived the war and Andrew Coleman of Bandon who was the guest speaker. Andrew, in his powerpoint presentation, told of his own involvement in local history and shared many stories . On the new plaque is included a quotation from Mustafa Kemal Atatürk, the first President of modern Turkey, who fought against the allies in the First World War. He wrote the following piece as the world came to grips with the aftermath of the war and the reality of the carnage sank in and the decision was made to bury the dead where they fell. Heroes who shed their blood and lost their lives! You are now lying in the soil of a friendly country. Therefore rest in peace. There is no difference between the Johnnies and Mehmets (Turkish soldiers)to us where they lie side by side here in this country of ours. You, the mothers, who sent their sons from far away countries wipe away your tears; your sons are now lying in our bosom and are in peace. After having lost their lives on this land they have become our sons as well. This entry was posted in Anniversaries, Centenaries in Ireland, Centenary, Church in Society, Church Services, Ecumenism, Memorial Service, Remembrance, Remembrance Sunday. Bookmark the permalink.